One of our most controversial forecasts is that by 2040, Japan will rise as East Asia’s leading power. Readers often ask for an explanation of the logic in this forecast. They understand that we are bearish on China. And while some readers may disagree on that point, they usually see that the reasoning is sound and that China will face serious problems in coming years. Japan, however, seems a bridge too far. Its population is less than a tenth of China’s (and it’s not just aging but shrinking). Japan also has a debt-to-GDP ratio over 229%. So, how is it that Japan will emerge in the next 25 years as East Asia’s most powerful country? In practical terms, this means that China’s biggest economic weakness — and its most potent enemy — is poverty. Regional economic disparities exist in many countries in the world. 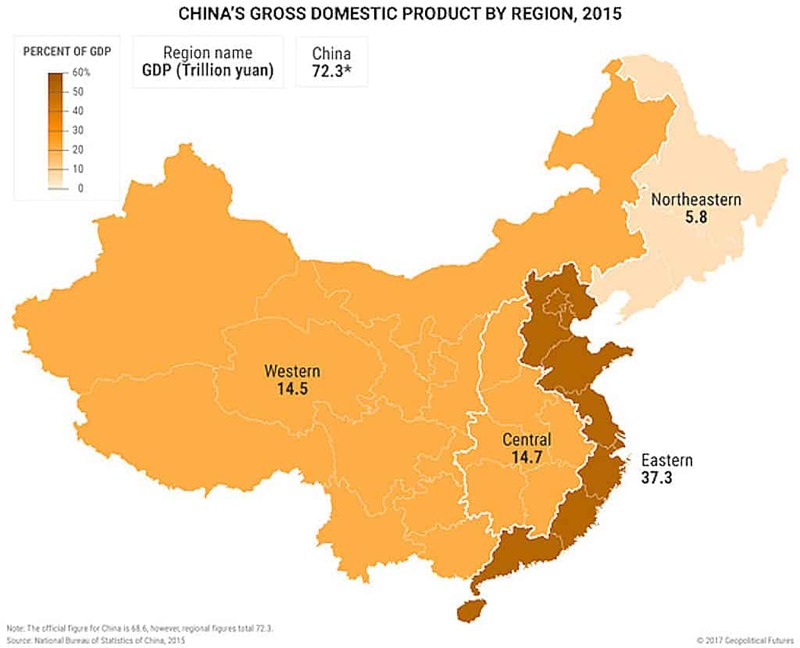 But in China, they have always been particularly acute, causing massive wealth disparity between China’s coastal provinces and its other regions. Factoring in the Tokyo greater metropolitan area increases this figure. According to the latest available data from the Organization for Economic Co-operation and Development (from 2012), Tokyo had the largest GDP of any city in the world at $1.48 trillion. (Seoul was second with a GDP of less than half of that.) 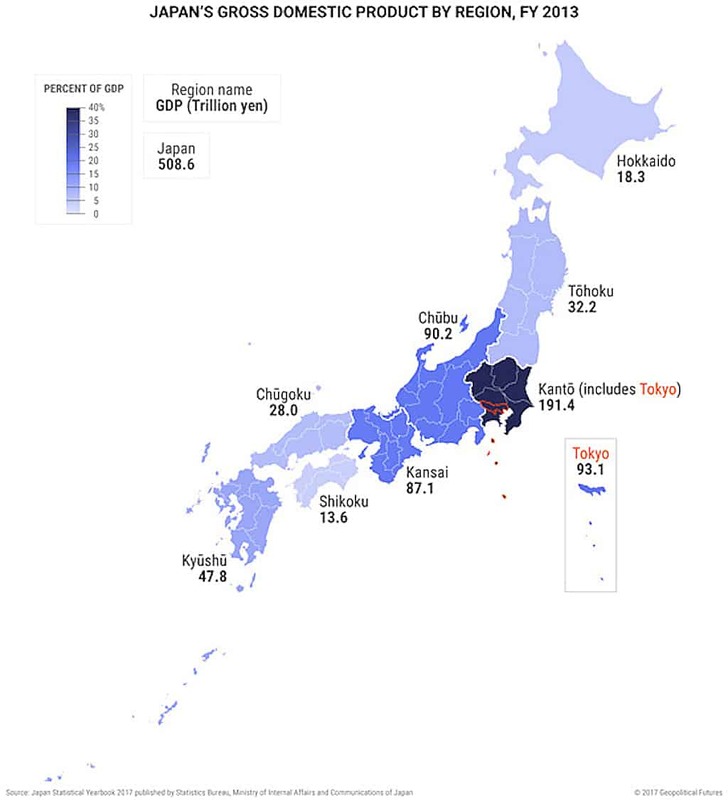 That means that greater Tokyo accounts for almost a third of Japan’s total GDP. It is not strictly about size: The diversity resulting from size is what holds China back. Japan does not have to deal with the type of coastal versus interior diversity that China does. There is, for example, a wide gulf in per capita income at both the rural and urban level in China. A rural household in Shanghai, for example, makes two times less than a rural household in Tibet, while an urban household in Tibet makes less than half of what an urban household in Shanghai does. Some will argue that Japan’s bigger problem is demographics. It is true that Japan has a rapidly aging population. But so does China: The number of working-age Chinese has been declining since 2013. Most European countries also face this issue, Germany most prominent among them. Demographics are notoriously hard to predict, as are the effects of demographic changes. To be clear, China is still an immensely powerful country relative to most in the world. In addition, much of our writing remains focused on understanding how economic problems in China are manifesting in political challenges. For now, Japan is less dynamic and important, though it will become more so, and our writing will increase as it does. — Leading Power: A Look at Japan vs. China originally appeared at Mauldin Economics. NextAre Democrats Institutionally Anti-Semitic Now?